The original intent of my visit to Beale, a U.S. Air Force Base just north of Sacramento, CA, was a first-person account of a flight aboard the venerable U-2, America's high-altitude surveillance aircraft known as Dragon Lady that flies above 70,000 feet. A Beale AFB T-38 piloted by Scott Collins (forward cockpit), with writer Jim Clash in the aft cockpit. After a series of back-and-forths with senior management at the base, which lasted 18 months, my flight ultimately was scrapped. But the compromise offered if I visited would give plenty of opportunities to report on the U-2 and Beale. First, I would fly in the T-38 Talon, the USAF's supersonic jet trainer used for U-2 pilots. Second, I would suit up and pressurize with 100% oxygen in the U-2’s unique yellow space suit. Third, I would get to chase U-2s on Beale's runway at 120 mph in a Dodge Charger as they performed touch-and-go landings. And fourth, I would have access to high-level base personnel, including Lt. Col. Carl Maymi, for interviews. I decided to go for it. 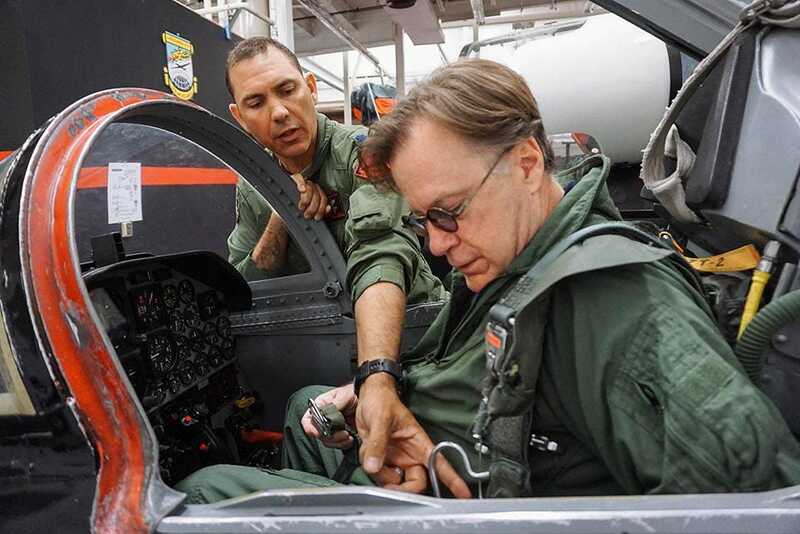 To fly in a T-38 as a civilian is not easy. You must get medical clearance not once, but twice - first from a personal physician, then from the local base doctor. After that, it’s a day of training maneuvers to learn to egress from the aircraft in the event of a major malfunction on the ground or in the air. Finally, one has to pucker up and get into the aircraft’s cockpit to lay one's own courage on the line. 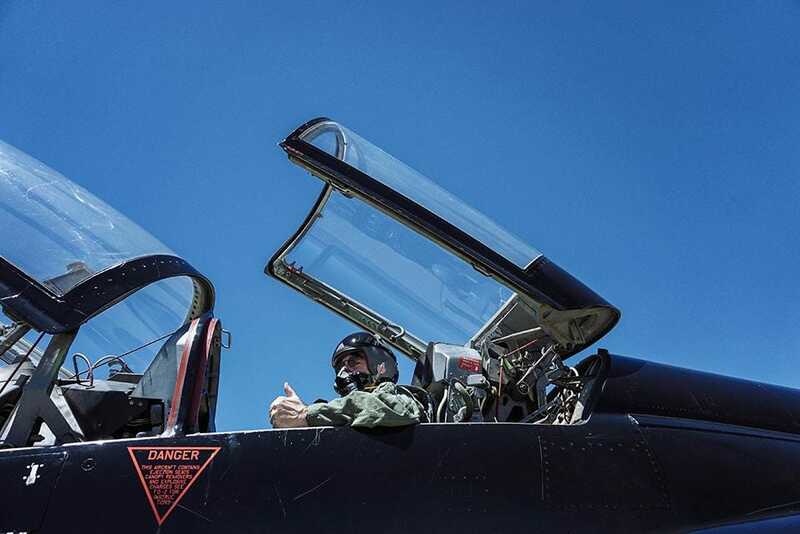 Pilot Scott "Fonix" Collins instructs writer Jim Clash on egress procedures for the T-38 at Beale AFB. The first T-38s came off of Northrop’s production line in the early 1960s. More than 1,100 of the $6-million machines have been built, many still in operation around the world with the USAF. They are all two-seaters, with separate cockpits for the pilot and the trainee. As such, each has its own ejection seat and flight operational controls. 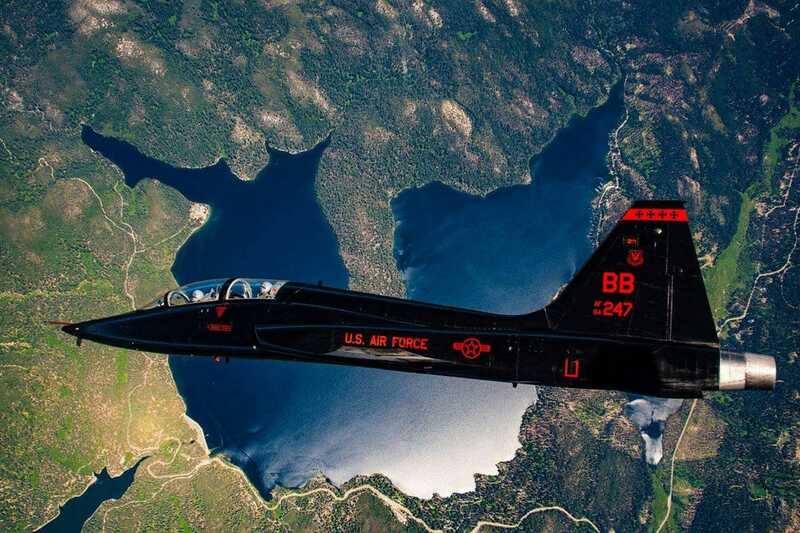 Beale AFB was founded in the 1940s and houses U-2s, T-38s and RQ4 Global Hawks. It encompasses 23,000 acres and employs more than 1,000 military personnel. The base's 12,000-foot runway is one of the USAF's longer landing strips. Beale gathers and provides valuable information to the U.S. government critical for decisions on national defense. As the crew straps me in to the T-38’s cramped cockpit - parachute on my back, pressure suit on my legs and oxygen mask over my nose and mouth - I think about what I’m getting myself into. This past May, a T-38 crashed near Columbus AFB in Mississippi. Both pilots ejected and were fine, and such crashes are rare, but it still makes you think. Once the two engines were fired, one after the other, it was time for me to pull out the red pins on my ejection seat, meaning the charge under me became live. Oh boy, I thought, here we go. Don't touch those two handles. After we taxied out to the runway, I manually closed my cockpit and braced for a 170-mph-plus takeoff. On the right was another T-38 to take off next to, and to fly in formation with, us. My pilot up front was R. Scott Collins, a 45-year-old father with the call sign FONIX. The former Marine Corps pilot, who also flies the U-2, is the ultimate “calm under pressure” guy. Before our sortie, he casually mentioned that his big event of the day was going home later to work on his lawn’s sprinkler system. After a jolting takeoff with afterburners, we quickly climbed above 10,000 feet. Our first maneuver was a 180-degree turn to test my G-force tolerance. We hit four (one G is equal to one’s body weight) Gs for about 30 seconds and decided that level would be our limit for maneuvers that day. We played some simulation war games with the other aircraft at over 350 mph, crisscrossing paths. At points, our wings were just three feet apart. The view of Lake Tahoe below was spectacular, as were the snow-capped mountains nearby. Although extremely clumsy with all of my equipment on, I managed to pull out the cellphone from my pressure suit to take some photos. It was well worth the effort. During a calm part of the flight, above 15,000 feet, Collins briefly let me take the controls. The responsiveness of the jet was amazing. It was like driving an Indy car in the sky. The ground was up, the sky down as Collins did some quick rolls, then two touch-and-go landings at Mather, a nearby base. Finally, it was time to head back to Beale. As on takeoff, our companion T-38 upon landing was situated right next to us. The flight had taken a little over an hour, which used up most of our fuel (T-38’s don’t carry much JP4), and I was pumped. 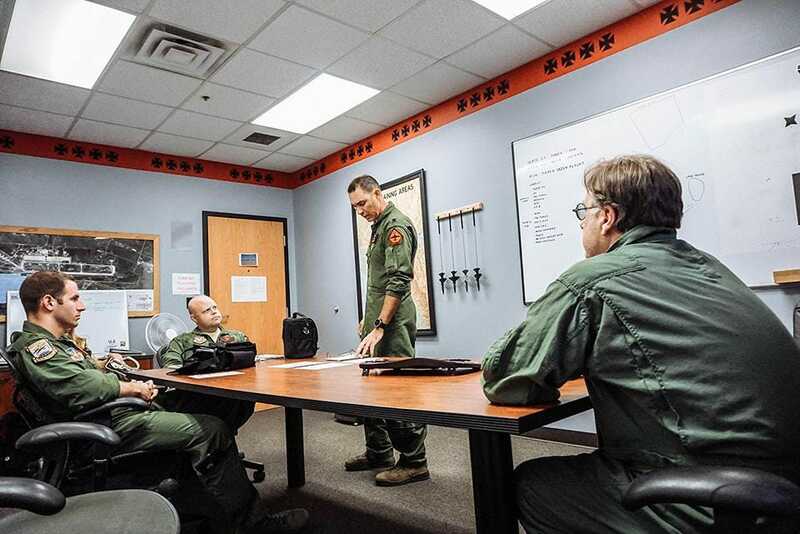 Pilot Scott Collins briefs T-38 flyers at Beale AFB during practice mission.